So at about seven-thirty last night I found out it was international donut day. Yep... I had to make them. Just had to, plus it gave me a chance to use my donut pan again. After stinking up the house for three-plus days with the smell of fried donuts I vowed never to make the fried version again... or at least do it when its seasonally appropriate to open all the windows in the house. Blistering cold winter and open windows = not fun. I found this recipe for the donuts and adapted the glaze for a chocolate ganache. 1 tsp vanilla or flavoring of choice. In a small sauce pan over medium heat add the cream and chocolate. Stir until the chocolate has melted then add the vanilla and salt until incorporated. It should be slightly thick. Now your donuts are ready for dipping and a sprinkling of your topping of choice. Here I chose chopped chocolate chips, chopped mini peanut butter cups, chopped peanuts, tropical coconut and powered sugar. Makes more then enough for 12 donuts. 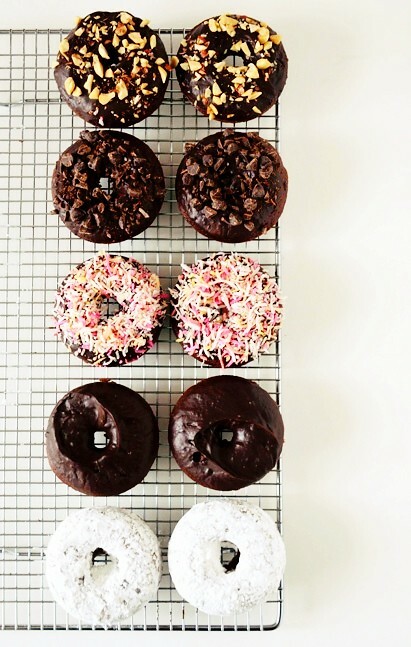 Your doughnuts look absolutely picture perfect! Love all the different toppings - so pretty. Oh...my goodness now I have to make these! They look delicious! These look incredible! Definitely got donut cravings now. Love the photo. That photo is making me long for donuts! Your blog is super! I'm so glad to stummbled on it! Count me as your newest follower dear! Have a nice day and hope to see you around! What lovely toppings. Your donuts look delicious! These donuts look so good! Yum! !